BELFAST, Britain, April 14 (Xinhua) -- A new chapter in China-Northern Ireland ties has been opened with the launching of Northern Ireland's first Confucius Institute on Friday. The Confucius Institute at the University of Ulster (CIUU) opened its doors Friday with an opening ceremony in Jordanstown, near Belfast. 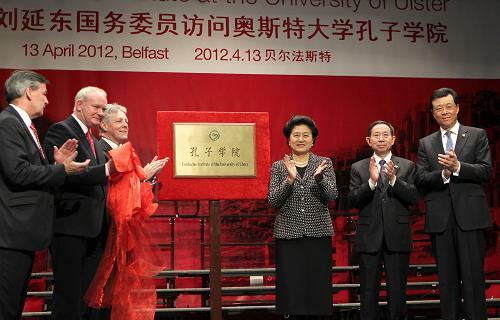 China's State Councilor Liu Yandong, Northern Ireland's First Minister Peter Robinson, Deputy First Minister Martin McGuinness and Vice Chancellor of the University of Ulster Richard Barnett attended the ceremony. Liu said the high-level people-to-people exchange mechanism between China and Britain is the first of its kind between China and a European Union country. The mechanism would help the two countries further understand and learn from each other, and deepen friendship between the two peoples. Along with mutual political trust and economic and trade cooperation, the high-level people-to-people exchange mechanism forms one of the three pillars of the China-Britain relationship, she said. Speaking to teachers and students of the University of Ulster, Liu said educational exchange plays an important role in people-to-people exchanges. China has made opening-up and cooperation parts of its national education plan, and is ready to work with high-level foreign universities to cultivate talents who have an international vision, she said. She hoped Chinese and British universities would deepen cooperation in the exchange of teachers and students, establishing research and development platforms, and sharing teaching ideas and other resources. Such cooperation would promote innovation in talent cultivation, scientific research, community service and cultural heritage, she said. The state councilor highlighted the importance of language, which she said facilitates people-to-people exchanges and is a valuable tool for making friends and strengthening cooperation. At present, more than 500 elementary and secondary schools in Britain are offering Chinese language courses, and up to 19 Confucius Institutes have been established in the country, more than in any other country in Europe. Robinson and McGuinness said they were impressed by China's achievements in economic and social development, and said they wish to enhance pragmatic cooperation with China. They said Britain and China share great potential in educational cooperation, and that the new Confucius Institute would become an important bridge for cultural exchanges and friendship between China and Northern Ireland. Barnett said the launching of the CIUU was a significant milestone in China-Northern Ireland cooperation. "Confucius Institutes not only promote the teaching of Chinese language and culture, but facilitate the training of language teachers, cultural and academic exchanges and research into China's education system, economy, the arts and society," he said. Pilot Mandarin Chinese teaching programs will be launched in Northern Ireland's elementary and secondary schools. The CIUU will also offer courses for businesspeople seeking to boost their profile in China. The opening ceremony, which featured Chinese and Irish music and dancing and Chinese calligraphy, was attended by over 150 prominent figures from education, business and politics from Northern Ireland and China.